Bumgyur Dawa is the Tibetan term for a month where karmic actions are multiplied by 100,000. The first fifteen days of the first month of the Tibetan new year celebrate Śākyamuni Buddha’s fifteen day performance of miracles to inspire faith and devotion in followers. However, as Buddhist practitioners, we do not merely celebrate an ancient holiday. Of course, we recall the kindness of the Buddha and his great followers. Yet even more importantly, during this time devoted practitioners pay special attention to their conduct and their meditation. This month presents us with are a special opportunity to accumulate vast amounts of merit. That’s because during this period, all activities generate karma that is one hundred thousand times stronger. The Tibetan name refers to the number “bum” meaning multiplying by 100,000 all our actions. And that multiplication applies also on auspicious days! In this way, as we practice, we truly can accumulate vast amounts of merit for the benefit of all beings. All the great masters teach that we need to accumulate both merit and wisdom in order to attain awakening and truly benefit beings. 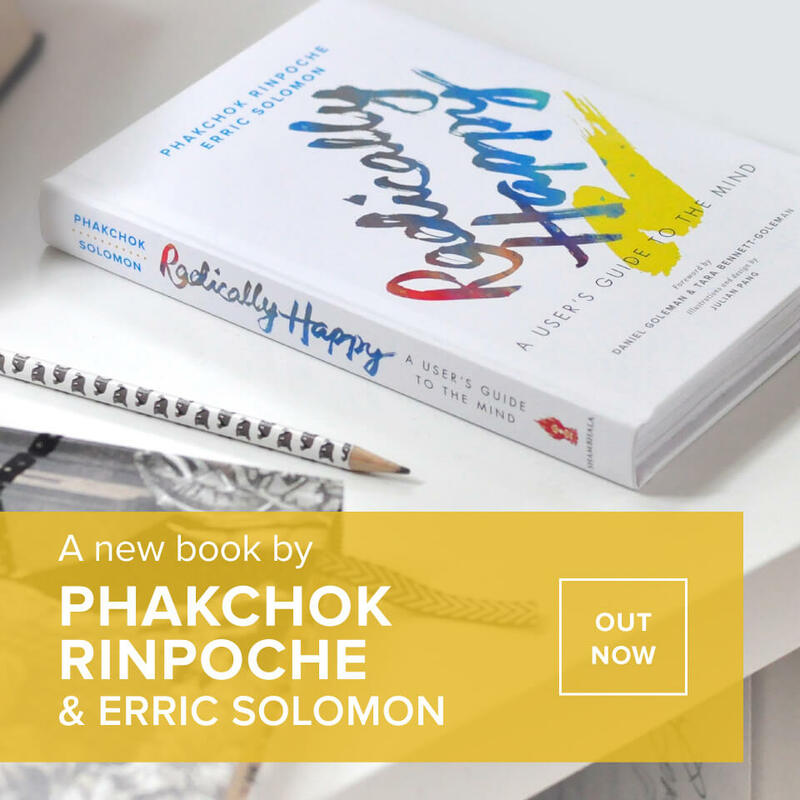 Thus, we can rejoice in this tremendous opportunity in this first month of the new year to skilfully act and practice for all sentient beings. We can rejoice in our precious human rebirth, and rededicate and inspire ourselves to engage in activities that alleviate suffering and bring true happiness. And, we can use all the skillful means the Buddha, Guru Rinpoche, and all the great masters have taught. There are so many ways that we can make this month extraordinarily meaningful. We can supplicate, make offerings, go on pilgrimage, offer generosity to the sangha and to the poor, and make vast aspirations. Moreover, we can supercharge all of these by relying on Vajrayāna techniques such as multiplying mantras. On the first day, the Buddha pressed his tooth-stick in the ground, and it immediately turned into a beautiful tree full of flowers and ripe fruit. On the second day, he emanated two mountains of jewels. On the third day, he created a jeweled lake. On the fourth day, voices came from the lake explaining all aspects of the Dharma. On the fifth day, the Buddha radiated golden light from his face. This filled the entire world, purifying the afflictions of sentient beings. On the sixth day, he gave people the ability to read each others’ thoughts. On the seventh day, he transformed his Sakya clan benefactors into world-rulers. On the eighth day, the Buddha pressed down on his throne with the fingers of his right hand. 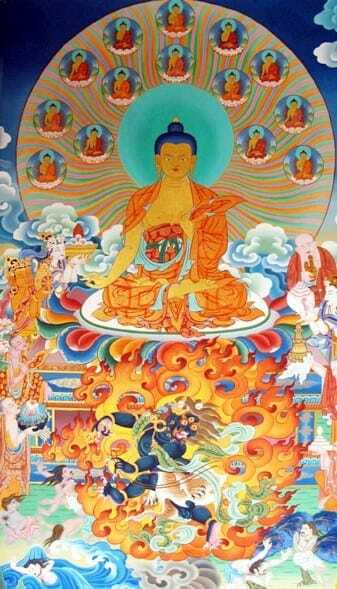 At that moment, Vajrapani appeared from brandishing a flaming vajra at the six non-believing teachers. Members of Vajrapani’s retinue scattered the heretics and smashed the thrones of their teachers. The heretics fled in fear. At that point, the Buddha radiated eighty four thousand rainbow colored light rays. At the tip of each light ray sat a buddha on a lotus throne. And each of these was surrounded by attendants. Onlookers saw these buddhas teaching the Dharma, and many were liberated by just this sight. Because of this display, the ninety thousand followers renounced their former teachers, adopted the Buddhist Dharma, joined the monkhood, and later became arhats. 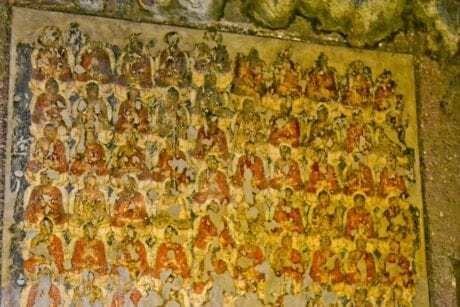 Then, for seven more days Buddha Śākyamuni performed more miracles for the entire gathering and gave them teachings. highest heaven. Then, he emitted light rays into all directions while he taught the Dharma. On the tenth day the four great kings who protect the Dharma invited Buddha to speak. This time, the Buddha expanded his body until it reached the height of samsara. And once again, he emanated light rays which then expounded the Dharma. On the eleventh day the great patron Anāthapiṇḍada made offerings to the meditating Buddha. The Buddha concealed his physical body, but radiated a golden light, and projected his voice so that all could hear. On the twelfth day Buddha entered into a meditation on great love, and golden light radiated from his body, extending throughout the worlds. These rays of light purified the three poisons from the onlookers and they gave rise to great compassion. of light and upon each point or these sat a buddha, teaching the Dharma while seated on a lotus throne. These buddhas filled all the world systems. On the fourteenth day a king offered flowers to the Buddha. The Buddha transformed these flowers into chariots made of precious jewels. Then, the Buddha taught the Dharma to all beings as a doctor healed the sick. On the fifteenth, final day of the spring celebration, King Bimbisara made offerings to the Buddha.The Buddha asked King Bimbisara to bring vessels for food and these spontaneously filled with foods of a hundred different tastes. When the assembly ate, their bodies and minds were completely satisfied. Buddha then asked, “Why do we experience such immeasurable suffering in the world?” By his blessing, all beings, including demons, realized that they themselves had caused their own misery by their mistaken actions. When they realized this, the assembly all developed great faith. The Tibetan new year begins on February 5, 2019 and Chötrul Düchen takes place on the full moon, February 19, 2018. We at Samye Institute wish you a very happy New Year and great accomplishment in your practice for the benefit of all beings! We rejoice in all the merit! Bumgyur Dawa é o termo tibetano para um mês no qual ações cármicas são multiplicadas por 100,000. Nos primeiros quinze dias do primeiro mês do novo ano tibetano celebramos os quinze dias em que o Buda Śākyamuni realizou milagres para inspirar fé e devoção em seus seguidores. No entanto, como praticantes budistas, não nos limitamos a comemorar um feriado histórico. Evidentemente nos recordamos, da bondade do Buda e de seus grandiosos seguidores. No entanto, mais importantemente, durante este período os praticantes devotos prestam especial atenção a sua conduta e meditação. Este mês nos oferece uma oportunidade especial para acumular grandes quantidades de mérito. Isto porque durante este período todas as atividades geram carma de forma cem mil vezes mais intensa. O nome tibetano refere-se ao número “bum”que significa multiplicar por 100,000 todas as nossas ações. E essa multiplicação se aplica também aos dias auspiciosos! Assim, conforme praticamos, temos a oportunidade de acumular quantidades verdadeiramente imensas de mérito para o benefício de todos os seres. Todos os grandes mestres ensinam que devemos acumular tanto mérito quanto sabedoria para que possamos atingir o despertar e de fato beneficiar os seres. Assim, podemos nos regozijar nesta tremenda oportunidade neste primeiro mês do novo ano para agir habilmente e praticar em benefício de todos os seres sencientes. Podemos nos regozijar em nosso precioso renascimento humano, e renovar nossa dedicação e inspiração ao nos engajarmos em atividades que aliviem o sofrimento e promovam verdadeira felicidade. Podemos também empregar todos os meios hábeis que o Buda, Guru Rinpoche, e todos os grandes mestres ensinaram. Há muitas maneiras para fazermos deste um mês extremamente significativo. Podemos fazer preces, oferendas, peregrinar, oferecer generosidade à sangha e aos menos favorecidos e fazer vastas aspirações. Além disso, podemos potencializar estas atividades através de técnicas do Vajrayāna como mantras multiplicadores. Afresco dos Milagres nas cavernas budistas em Ajanta, Índia. No primeiro dia, o Buda pressionou um palito de dentes no chão e este imediatamente se transformou em uma linda árvore repleta de flores e frutas maduras. No segundo dia, ele emanou duas montanhas de jóias. No terceiro dia, ele criou um lago de jóias. No quarto dia, ouviram-se vozes vindas do lago, explicando todos os aspectos do Dharma. No quinto dia, o Buda irradiou luz dourada de seu rosto. A luz preencheu o mundo inteiro, purificando as aflições dos seres sencientes. No sexto dia, ele concedeu às pessoas a habilidade de ler os pensamentos alheios. No sétimo dia, ele transformou os benfeitores de seu clã, os Sakyas, em monarcas universais. No oitavo dia, o Buda pressionou seu trono com os dedos da mão direita. Imediatamente Vajrapani surgiu brandindo um vajra flamejante contra os seis mestres descrentes. O séquito de Vajrapani espantou os hereges e pulverizou os tronos de seus mestres. Os hereges fugiram apavorados. A esta altura, o Buda emitiu oitenta e quatro mil raios de luz nas cores do arco-íris. Na extremidade de cada raio de luz havia um Buda num trono de lótus. E cada um destes estava rodeado por seu séquito. Os presentes viram estes Budas ensinando o Dharma, e muitos foram libertados por esta visão. Por causa desta demonstração, noventa mil seguidores renunciaram a seus antigos mestres, adotaram o Dharma do Buda, tomaram votos monásticos e vieram a se tornar arhats. Então, nos sete dias seguintes o Buda Shakyamuni realizou mais milagres para os ali reunidos e lhes concedeu ensinamentos. mais elevado reino celestial. Então ele emitiu raios de luz em todas as direções enquanto ensinava o Dharma. No décimo dia os quatro grandes reis que protegem o Dharma convidaram o Buda para que ele ensinasse. Desta vez, o Buda expandiu seu corpo até atingir a altura de todo o samsara. E mais uma vez ele emanou raios de luz e ensinou o Dharma. No décimo primeiro dia o grande patrono Anāthapiṇḍada fez oferendas ao Buda enquanto este meditava. O Buda ocultou seu corpo físico mas irradiou uma luz dourada e projetou sua voz de modo que todos o pudessem ouvir. No décimo segundo dia Buda entrou em uma meditação de grande amor e irradiou uma luz dourada de seu corpo que se estendeu a todos os universos. Estes raios de luz purificaram os três venenos dos que ali estavam e lhes inspiraram grande compaixão. raios de luz e na extremidade de cada um destes havia um Buda ensinando o Dharma sentado num trono de lótus. Estes Budas preencheram todos os universos. No décimo quarto dia um rei ofereceu flores ao Buda. O Buda transformou essas flores em carruagens feitas de pedras preciosas. Então, o Buda ensinou o Dharma para todos os seres como um médico que cura os doentes. No décimo quinto, o último dia da celebração da Primavera, o rei Bimbisara fez oferendas ao Buda. O Buda solicitou que o rei Bimbisara trouxesse potes de mantimentos que espontaneamente se encheram de comidas de cem diferentes sabores. Quando os ali reunidos comeram, seus corpos e mentes se satisfizeram completamente. Buda então perguntou,”Por que experienciamos imensurável sofrimento no mundo? ” Por sua graça, todos os seres, incluindo os demônios, perceberam que eles mesmos haviam causado seu próprio sofrimento através de suas ações equivocadas. Ao perceberem isto, os ali reunidos desenvolveram grande fé no Buda. O novo ano tibetano se inicia em 16 de fevereiro de 2018 e Chötrul Düchen ocorre na lua cheia, 2 de Março de 2018. Nós do Instituto Samye lhes desejamos um feliz Ano Novo e grandes conquistas em sua prática para o benefício de todos os seres! Regozijamo-nos em todo o mérito! Ao fim do ensinamento, lembre-se de dedicar o mérito de ter recebido um ensinamento Dharma. Ao longo do dia, dedique alguns momentos para se recordar destas instruções. Luangkanlah waktu sejanak sebelum menyaksikan ataupun mendengarkan klip ini untuk memosisikan tubuh anda pada posisi tegak. Dengarkanlah ajaran ini dengan berpikir, “Saya sangatlah beruntung memiliki kesempatan untuk mendengarkan Dharma yang berharga ini. Saya melakukan hal ini untuk mendatangkan manfaat bagi semua makhluk sehingga mereka bisa terbebas dari penderitaan dan mencapai pencerahan sempuna “. Bumgyur Dawa adalah istilah dalam bahasa Tibet untuk sebuah bulan dimana tindakan-tindakan karma akan berlipatganda sampai 100,000 kali. Limabelas hari pertama pada bulan pertama dalam tahun baru Tibet merayakan pertunjukan keajaiban dari Sakyamuni Buddha untuk menginspirasi keyakinan dan devosi pada para pengikut beliau. Namun demikian, sebagai para praktisi Buddhis, kita tidaklah hanya merayakannya sebagai sebuah hari libur masa lampau. Tentu saja, kita mengingat kembali kebaik hatian dari Buddha dan para pengikut beliau yang agung. Namun yang bahkan lebih penting, selama periode waktu ini para praktisi yang berdedikasi menaruh perhatian khusus pada tingkah laku dan meditasi mereka. Bulan ini memberikan kita kesempatan yang special untuk mengumpulkan jasa kebajikan yang sangat besar jumlahnya. Hal ini disebabkan pada jangka waktu ini, semua aktivitas menghasilkan karma yang seratus ribu kali lebih kuat. Istilah Tibet yang mengacu pada angka “bum” mengandung arti berlipatganda 100,000 kali untuk semua tindakan kita. Dan pelipatgandaan tersebut berlaku juga pada hari-hari besar! Dengan cara ini, ketika kita berlatih, kita benar-benar bisa mengumpulkan jasa kebajikan yang sangat besar jumlahnya untuk mendatangkan manfaat bagi semua makhluk. Semua guru agung mengajarkan bahwa kita perlu mengumpulkan baik jasa kebajikan dan kebijaksanaan untuk mencapai pencerahan dan benar-benar mendatangkan manfaat bagi para makhluk. Dengan demikian, kita bisa bersukacita akan kesempatan berharga ini di bulan pertama dari tahun baru untuk secara mahir bertindak dan berlatih untuk semua makhluk. Kita bisa bersukacita akan kelahiran kita sebagai manusia yang berharga, dan mendedikasikan ulang dan menginspirasi diri kita sendiri untuk melibatkan diri dalam aktivitas-aktivitas yang dapat mengurangi penderitaan dan mendatangkan kebahagiaan yang sebenarnya. Pada hari pertama, Buddha menusukkan tusuk gigi beliau diatas tanah, dan segera setelahnya berubah menjadi pohon yang indah penuh dengan bunga dan buah-buahan yang matang. Pada hari kedua, beliau mengemanasikan dua gunung yang terbuat dari permata. Pada hari ketiga, beliau menciptakan sebuah danau penuh permata. Pada hari keempat, suara-suara terdengar dari dalam danau menjelaskan semua aspek tentang Dharma. Pada hari kelima, Buddha memancarkan cahaya keemasan dari wajah beliau. Cahaya ini memenuhi keseluruhan dunia, memurnikan noda-noda batin dari para makhluk. Pada hari keenam, beliau memberikan kemampuan pada orang-orang untuk saling membaca pikiran mereka masing-masing. Pada hari ketujuh, beliau mentransformasikan para donatur dari suku Sakya beliau menjadi para penguasa dunia. Pada hari kedelapan, Buddha menekan tahta beliau dengan jari tangan kanan beliau. Pada saat tersebut, Vajrapani muncul dari acungan vajra yang menyala-nyala yang diarahkan pada enam guru yang tidak percaya. Para anggota dari pengikut Vajrapani mengkocar kacirkan para penganut sesat dan menghancurkan tahta dari guru-guru mereka. Para penganut sesat melarikan diri dengan rasa takut. Pada saat tersebut, Buddha memancarkan delapan puluh empat ribu berkas cahaya berwarna pelangi. Pada setiap ujung dari berkas cahaya duduk seorang buddha diatas tahta yang terbuat dari bunga teratai. Dan setiap darinya dikelilingi oleh para pengikut. Mereka yang ada di tempat tersebut melihat para buddha tersebut mengajarkan Dharma, dan banyak dari mereka yang terbebaskan hanya dengan melihat pemandangan ini. Dikarenakan pertunjukan ini, sembilan puluh ribu pengikut meninggalkan guru-guru mereka sebelumnya, menerima Buddhist Dharma, bergabung dengan para bhikkhu, dan kemudian hari menjadi arahat. Kemudian, selama tujuh hari berikutnya Buddha Shakyamuni mempertunjukkan lebih banyak keajaiban untuk keseluruhan semua yang berkumpul dan memberikan mereka ajaran-ajaran. Pada hari kesembilan raja dari para dewa, Brahma, memberikan persembahan kepada Buddha. Buddha mengembangkan tubuh beliau sampai mencapai ke surga yang tertinggi. Kemudian, beliau mengeluarkan berkas cahaya ke seluruh penjuru mata angin sambil beliau mengajarkan Dharma. Pada hari kesepuluh empat raja agung yang menjadi pelindung Dharma mengundang Buddha untuk mengajar. Pada saat ini, Buddha mengembangkan tubuh beliau sampai mencapai ketinggian samsara. Dan sekali lagi, beliau mengemanasikan berkas cahaya yang kemudian membabarkan Dharma. Pada hari kesebelas donatur agung Anāthapiṇḍada memberikan persembahan kepada Buddha yang sedang bermeditasi. Buddha menyembunyikan tubuh fisik beliau, namun memancarkan cahaya keemasan, dan memproyeksikan suara beliau sehingga semua dapat mendengarnya. Pada hari keduabelas Buddha memasuki meditasi akan cinta yang agung, dan cahaya keemasan memancar dari tubuh beliau, menjangkau kesemua dunia. Berkas-berkas cahaya ini memurnikan tiga racun dari mereka yang hadir dan mereka membangkitkan rasa welas asih yang agung di dalam diri mereka. Pada hari ketigabelas Buddha, ketika duduk diatas tahta singa, memancarkan dua berkas cahaya dari pusar beliau. Cahaya ini naik setinggi lima belas meter, dan pada setiap ujungnya terdapat sekuntum bunga teratai, dan pada setiap bunga teratai, duduk seorang buddha. Dari pusar dari setiap buddha memancar dua berkas cahaya dan di setiap ujung dari berkas tersebut duduk seorang buddha, mengajar Dharma sambil duduk diatas sebuah tahta bunga teratai. Para buddha ini mengisi semua sistem dunia. Pada hari keempatbelas seorang raja memberikan persembahan bunga kepada Buddha. Buddha mentransformasikan bunga-bunga ini menjadi kereta kencana yang terbuat dari permata-permata yang berharga. Kemudian, Buddha mengajarkan Dharma kepada semua makhluk bagaikan seorang dokter yang menyembuhkan mereka yang sakit. Pada hari kelimabelas, hari terakhir dari perayaan musim semi, Raja Bimbisara memberikan persembahan kepada Buddha. Buddha meminta Raja Bimbisara untuk membawa nampan untuk makanan dan semua nampan ini secara spontan terisi oleh makanan dengan seratus rasa yang berbeda. Ketika para hadirin makan, tubuh dan batin mereka sepenuhnya terpuaskan. Buddha kemudian bertanya, “Mengapa kita mengalami begitu banyak penderitaan yang tak terhingga jumlahnya di dunia?” Dengan berkah beliau, semua makhluk, termasuk para setan, menyadari bahwa diri mereka sendiri telah menyebabkan penderitaan mereka sendiri dikarenakan tindakan-tindakan mereka yang salah. Ketika mereka menyadari hal ini, para hadirin semuanya mengembangkan keyakinan yang agung. Tahun baru Tibet dimulai pada tanggal 16 Februari 2018 dan Chötrul Düchen diperingati pada bulan purnama, 2 Maret 2018. Kami dari Samye Institute berharap anda mendapatkan Tahun Baru yang sangat berbahagia dan pencapaian yang agung dalam semua latihan yang anda lakukan untuk mendatangkan manfaat bagi semua makhluk! Kami bersukacita akan semua kebajikan ini! Di akhir dari pengajaran, ingatlah untuk mendedikasikan/melimpahkan jasa dari menerima ajaran Dharma. Seiring anda menjalani aktivitas harian anda, luangkanlah waktu sejenak dari waktu ke waktu untuk mengingat kembali semua instruksi-instruksi ini. Antes de ver o escuchar este clip, tomen un momento para físicamente calmarse y sentarse con la espalda derecha. Escuchen las enseñanzas pensando “soy extremadamente afortunado de tener la oportunidad de escuchar este preciado Dharma y lo hago para el beneficio de todos los seres, para que puedan estar libres de sufrimiento y alcanzar el despertar completo”. Bumgyur Dawa es el término Tibetano para designar un mes donde las acciones kármicas se multiplican por 100,000. En los primeros quince días del primer mes del Año Nuevo Tibetano se celebran los quince días en los que Śākyamuni Buddha realizó Milagros para inspirar la fe y la devoción en sus seguidores. Sin embargo, como practicantes budistas, no celebramos solamente una festividad antigua. Por supuesto, recordamos la bondad de Buddha y de sus grandes seguidores. Pero lo más importante es que durante este tiempo, los practicantes comprometidos pongan una atención especial en su conducta y en su meditación. Este mes nos da una oportunidad especial para acumular un gran mérito. Esto es porque durante este periodo, todas las actividades generan un karma que es cien mil veces más fuerte. El nombre tibetano Bum se refiere a que todas nuestras acciones se multiplican por 100,000. ¡Esta multiplicación también es válida para los días auspiciosos! De esta manera, al ir practicando, vamos acumulando verdaderamente grandes cantidades de mérito para el beneficio de todos los seres. Todos los grandes maestros enseñan que necesitamos acumular mérito y sabiduría para alcanzar el despertar y verdaderamente beneficiar a los seres. Así que, podemos regocijarnos en esta gran oportunidad que nos da este primer mes del nuevo año para actuar hábilmente y practicar para todos los seres sintientes. Podemos regocijarnos de nuestro renacimiento con una preciada vida humana y volver a dedicar e inspirarnos a nosotros mismos para llevar a cabo actividades que alivian el sufrimiento y brindan una verdadera felicidad. Y podemos usar todos los medios hábiles que Buddha, Guru Rinpoche, y que todos los grandes maestros enseñaron. Hay muchas maneras en las que podemos hacer este mes extraordinariamente significativo. Podemos orar, hacer ofrendas, hacer un peregrinaje, ofrecer generosidad a la sangha y a los pobres y hacer vastas aspiraciones. Además podemos incrementar esto con las técnicas Vajrayāna tales como los mantras que multiplican. [Picture text]Fresco de los Milagros en las cuevas Budistas en Ajanta, India.El primer día, el Buddha presionó su palillo de dientes en el suelo e inmediatamente se convirtió en un bello árbol, lleno de flores y de fruta madura. En el segundo día, emanó dos montañas de joyas. En el tercer día, creó un lago con joyas. En el cuarto día, salieron voces del lago explicando todos los aspectos del Dharma. En el quinto día, el Buddha irradiaba luz dorada de su rostro. Esto llenó todo el mundo, purificando las aflicciones de los seres sintientes. En el sexto día, les dio la capacidad a las personas de leer los pensamientos de los demás. En el séptimo día, transformó los benefactores de su clan Sakya en gobernantes del mundo. En el octavo día, el Buddha presionó su trono hacia abajo con los dedos de su mano derecha. En ese momento apareció Vajrapani blandiendo un vajra en llamas sobre los seis maestros no creyentes. Los miembros del séquito de Vajrapani dispersaron a los herejes y rompieron los tronos de sus maestros. Los herejes huyeron llenos de miedo. En ese momento, el Buddha irradió ochenta y cuatro mil rayos de luz de color de arcoíris. En la punta de cada rayo de luz había un buddha sentado en un trono de loto. Cada uno de ellos estaba rodeado de asistentes. Los espectadores vieron a estos buddhas enseñando el Dharma, y muchos fueron liberados al sólo ver esto. Gracias a esta exhibición, los noventa mil seguidores renunciaron a sus antiguos maestros, adoptaron el Dharma budista, se hicieron monjes y más tarde se convirtieron en arhats. Después, por siete días más, Buddha Shakyamuni realizó mas milagros para toda la concurrencia y les dio enseñanzas. En el noveno día, el rey de dioses, Brahma, hizo ofrendas a Buddha. El Buddha expandió su cuerpo hasta que alcanzó el cielo más alto. Entonces, emitió rayos de luz en todas las direcciones mientras enseñaba el Dharma. En el décimo día, los cuatro grandes reyes que protegen el Dharma invitaron a Buddha a hablar. Esta vez, Buddha expandió su cuerpo hasta que alcanzó el tamaño del samsara. Y una vez más, emanó rayos de luz que proclamaban el Dharma. En el onceavo día, el gran mecenas Anāthapiṇḍada hizo ofrendas al Buddha meditando. El Buddha ocultó su cuerpo físico pero irradiaba una luz dorada y proyecto su voz para que todos pudieran escuchar. En el doceavo día Buddha entró en una meditación en gran amor y su cuerpo irradiaba luz dorada, que se extendía hacia los mundos. Estos rayos de luz purificaron los tres venenos de los espectadores e hicieron surgir una gran compasión. En el treceavo día, el Buddha, mientras estaba sentado en el trono de león, emitió dos rayos de luz desde su ombligo. Estos rayos de luz se elevaron quince metros, y cada punto era un loto, y en cada loto, un buddha. Desde el ombligo de cada buddha se extendieron dos rayos de luz y sobre cada uno de estos había un buddha sentado en un trono de loto, enseñando el Dharma. Estos buddhas llenaron todos los sistemas del mundo. En el catorceavo día, un rey ofreció flores al Buddha. El Buddha transformó estas flores en carretas con joyas hermosas. Después el Buddha enseñó el Dharma a todos los seres como un doctor que sana a los enfermos. En el quinceavo y último día de la celebración de primavera, el Rey Bimbisara hizo ofrendas al Buddha. El Buddha pidió al Rey Bimbisara que trajera recipientes para comida y éstos se llenaron espontáneamente con diversas comidas de cien sabores diferentes. Cuando la asamblea comió, sus cuerpos y sus mentes estaban completamente satisfechos. Entonces Buddha preguntó “¿Por qué experimentamos un sufrimiento inconmensurable en el mundo?” Gracias a su bendición, todos los seres, incluyendo a los demonios, se dieron cuenta de que ellos mismos habían causado su propio dolor a través de sus acciones erróneas. Al darse cuenta de esto, la asamblea desarrolló una gran fe. El año nuevo Tibetano empieza el 16 de Febrero del 2018. El Chötrul Düchen se lleva a cabo en la luna llena, el 2 de marzo del 2018. ¡Nosotros, en el Instituto Samye les deseamos un Feliz año nuevo y que tengan grandes logros en su práctica para el beneficio de todos los seres! ¡Nos regocijamos de todo el mérito! Al final de la enseñanza, por favor acuérdate de dedicar el mérito de recibir la enseñanza de Dharma. Durante el día, de vez en cuando, toma unos momentos para recordar estas instrucciones. Va rog sa va luati cateva clipe inainte de a privi sau de a asculta acest clip, pentru a va aranja fizic intr-o pozitie dreapta. Ascultati invataturile gandind: “Sunt extrem de norocos ca am posibilitatea de a asculta pretioasa Dharma. Fac acest lucru in beneficiul tuturor fiintelor simtitoare, pentru ca acestea sa se elibereze de suferinta si sa atinga iluminarea deplina”. Bumgyur Dawa este termenul tibetan pentru o luna in care actiunile karmice sunt multiplicate de 100,000. Primele cincisprezece zile din prima luna a anului nou tibetan sarbatoresc cele 15 zile in care Śākyamuni Buddha a savarsit miracole pentru a inspira credinta si devotament in randul discipolilor. Cu toate acestea, in calitate de practicanti budisti, nu celebram doar o sarbatoare straveche, ci, bineinteles, ne reamintim bunatatea lui Buddha si a maretilor sai discipoli. Dar, cu mult mai important, in aceasta perioada practicantii devotati acorda o atentie speciala comportamentului si meditatiei lor. Aceasta luna ne ofera o posibilitate speciala de a acumula merite nenumarate. Aceasta se intampla pentru ca, in aceasta perioada, toate activitatile genereaza karma care este de o suta de mii de ori mai puternica. Acest nume tibetan se refera la numarul “bum” insemnand multiplicarea cu 100,000 a tuturor actiunilor noastre. Si aceasta multiplicare se aplica si in zilele de bun augur! In acest mod, pe masura ce practicam, putem cu adevarat acumula nenumarate merite in beneficiul tuturor fiintelor. Toti marii maestri invata ca trebuie sa acumulam atat merit cat si intelepciune pentru a atinge iluminarea si a actiona cu adevarat in beneficiul fiintelor. Astfel, ne putem bucura de aceasta oportunitate extraordinara in aceasta prima luna a noului an pentru a actiona si a practica in mod abil in folosul tuturor fiintelor simtitoare. Ne putem bucura de pretioasa renastere umana pentru a ne rededica si a fi inspirati sa ne angajam in activitati care usureaza suferinta si aduc fericire autentica. Si putem folosi toate mijloacele abile pe care Buddha, Guru Rinpoche si toti marii maestri le-au impartasit. Exista atat de multe cai prin care putem face aceasta luna extraordinar de semnificativa. Putem invoca, aduce ofrande, face pelerinaje, da dovada de generozitate fata de sangha si de cei saraci, si face aspiratii marete. Cu atat mai mult, putem intensifica toate acestea bazandu-ne pe tehnicile Vajrayāna, precum mantrele de multiplicare. In prima zi, Buddha a apasat cu scobitoarea sa pamantul, si imediat aceasta s-a transformat intr-un copac frumos, plin de flori si de fructe coapte. In a doua zi, a emanate doi munti de nestemate. In a treia zi, a creat un lac de nestemate. In a patra zi, din lac s-au auzit voci care explicau toate aspectele Dharmei. In a cincea zi, fata lui Buddha a emis lumina aurie. Aceasta a umplut intreaga adunare, purificand emotiile negative ale fiintelor simtitoare. In a sasea zi, a daruit oamenilor abilitatea de a citi gandurile celorlalti. In a saptea zi, si-a transformat clanul sau de binefacatori Sakya in stapanatori ai lumii. Intr-a opta zi, Buddha a apasat tronul cu degetele mainii drepte. In acel moment, Vajrapani a aparut invartind un vajra invapaiat in directia celor sase invatatori necredinciosi. Membrii din suita lui Vajrapani au imprastiat ereticii si au distrus tronurile invatatorilor acestora. Ereticii, cuprinsi de frica, s-au imprastiat. In acel moment, Buddha a emis 84 de mii de raze de lumina de culoarea curcubeului. In varful fiecareia dintre aceste raze statea un buddha pe un tron de lotus, fiecare din acestia inconjurat de o suita. Privitorii ii vedeau pe acesti Buddha predand Dharma, si multi au fost eliberati doar de aceasta priveliste. Ca urmare a acestor manifestari, cei 90 de mii de discipoli au renuntat la fostii lor invatatori, au adoptat Dharma budista, s-au calugarit si, mai tarziu, au devenit arhati. Apoi, timp de inca sapte zile Buddha Shakyamuni a realizat si mai multe miracole pentru intreaga adunare si le-a acordat invataturi. In a noua zi, regele zeilor, Brahma, a adus ofrande lui Buddha. Buddha si-a extins corpul pana a ajuns la cel mai inalt Cer. Apoi, a emis raze de lumina in toate directiile in timp ce preda Dharma. In a zecea zi, cei patru regi mareti, care protejeaza Dharma, l-au invitat pe Buddha sa ia cuvantul. De aceasta data, Buddha si-a extins corpul pana a atins inaltimea samsarei. Si, inca o data, a emis raze de lumina , care, apoi, au expus Dharma. In a unsprezecea zi, marele patron Anāthapiṇḍada a adus ofrande lui Buddha, aflat in meditatie. Buddha si-a ascuns corpul fizic, dar a emis o lumina aurie si si-a proiectat vocea, astfel incat toti sa-l poata auzi. In a doisprezecea zi, Buddha a intrat intr-o stare meditativa dedicata iubirii marete si o lumina aurie a emanat din corpul sau, patrunzand toate lumile. Aceste raze de lumina au purificat cele trei otravuri in randul privitorilor si acestia au dat nastere maretei compasiuni. In a treisprezecea zi, Buddha, in timp ce statea pe tronul sau sustinut de lei, a emis, din zona buricului, doua raze de lumina. Aceste raze de lumina s-au ridicat 15 metri si, in varful fiecareia, se afla un lotus, iar pe fiecare, un buddha. Din buricul fiecaruia buddha ieseau doua raze de lumina si pe varful fiecareia statea un Buddha, care preda Dharma, asezat pe un tron de lotus. Acesti buddhasi au umplut toate sistemele de lumi. In a 14-a zi, un rege a oferit flori lui Buddha. Buddha a transformat aceste flori in care realizate din pietre pretioase. Apoi, Buddha a predat Dharma tuturor fiintelor, asemeni unui doctor care-i vindeca pe cei bolnavi. In a 15-a zi, ultima zi a sarbatorii primaverii, regele Bimbisara a adus ofrande lui Buddha. Buddha i-a cerut regelui Bimbisara sa aduca vase pentru mancare si acestea s-au umplut in mod spontan cu mancaruri avand o suta de savori diferite. Cand adunarea s-a infruptat din acestea, corpurile si mintile membrilor acesteia au fost complet satisfacute. Apoi Buddha a intrebat: “De ce experimentam in lume suferinta aceasta nesfarsita?” Prin binecuvantarea sa, toate fiintele, inclusiv demonii, si-au dat seama ca ei insisi si-au provocat propria nenorocire prin actiunile lor gresite. Cand a constientizat acestea, intreaga adunare a dezvoltat foarte multa credinta. Anul nou tibetan incepe pe 16 februarie 2018, iar Chötrul Düchen are loc pe 2 martie 2018, cand este luna plina. Noi, la Institutul Samye, va dorim un an nou fericit si realizari marete in practica voastra, in beneficiul tuturor fiintelor. Ne bucuram de toate aceste merite! La sfarsitul invataturii, va rog sa va amintiti sa dedicati meritul de a fi primit invatatura Dharmei. Pe parcursul zilei, luati-va cateva momente, din cand in cand, pentru a va aminti aceste instructiuni. Các bạn vui lòng dành ra vài phút trước khi xem hoặc nghe đoạn clip này để điều chỉnh lại cơ thể trong tư thế ngồi thẳng và nghiêm túc. Hãy lắng nghe nội dung truyền giảng và suy nghĩ rằng, “Tôi cảm thấy vô cùng may mắn khi có cơ hội lắng nghe Giáo Pháp cao quý. Tôi thực hiện việc này vì lợi lạc của tất cả chúng sinh hữu tình; nương theo công đức này, tôi nguyện cho tất cả thoát khỏi Khổ Đau và chứng đạt Giác Ngộ toàn triệt”. Bumgyur Dawa là từ thuộc Tạng Ngữ nói về tháng mà nghiệp của tất cả các hành động đều được Tăng Trưởng gấp 100,000 lần. Mười lăm ngày đầu tiên của Tháng Giêng trong năm mới theo Tạng Lịch, chúng ta kỷ niệm Mười lăm ngày Đức Phật Thích Ca Mâu Ni thi triển thần thông để hưng khởi tín tâm và lòng sùng kính trong Tăng chúng. Tuy nhiên, là một hành giả Phật Giáo, chúng ta không chỉ kỷ niệm ngày lễ xa xưa này một cách đơn thuần. Mà cố nhiên, chúng ta cần hồi tưởng lại về sự Từ Bi của Đức Phật cũng như các môn đồ vĩ đại của Ngài. Một điều thậm chí còn quan trọng hơn nữa chính là trong suốt thời gian này, những hành giả nhiệt tâm cần đặc biệt chú ý đến phẩm hạnh và việc thiền định của mình. Tháng Giêng này mang lại cho chúng ta cơ hội quý báu để tích lũy quảng đại công đức. Bởi vì trong khoảng thời gian này, nghiệp sinh ra từ tất cả những hoạt động sẽ được tăng trưởng gấp một trăm ngàn lần. Tiếng Tạng, con số này được đề cập trong chữ “bum” , nghĩa là nhân lên 100,000 lần tất cả những hành vi của chúng ta. Và sự nhân lên này cũng xảy ra vào những ngày cát tường! Tin tưởng như vậy, khi thực hành, chúng ta có thể thật sự tích lũy quảng đại công đức vì lợi ích của tất cả chúng sinh hữu tình. Tất cả những vị Đạo Sư vĩ đại đều dạy rằng chúng ta cần phải tích lũy công đức và trí tuệ để đạt được Giác Ngộ và thật sự làm lợi lạc cho chúng sinh. Vì vậy, chúng ta có thể hoan hỷ với những cơ hội lớn lao trong tháng đầu năm mới để hành động và thực hành một cách thiện xảo vì chúng sinh hữu tình. Chúng ta có thể hân hoan khi đang sở hữu thân người quý giá ngay tại kiếp sống này, rồi sau đó trở lại hồi hướng và truyền cảm hứng cho chính bản thân để tiếp tục dấn thân, tham gia vào các hoạt động làm vơi bớt khổ đau và đem lại hạnh phúc thật sự. Và, chúng ta có thể sử dụng tất cả những phương tiện thiện xảo mà Đức Phật, Đức Liên Hoa Sinh hay những vị Đại Sư đã truyền dạy. Có rất nhiều cách cho chúng ta thực hiện để khiến tháng này trở thành một tháng đặc biệt ý nghĩa. Chúng ta có thể khẩn cầu, cúng dường, hành hương, cúng dường rộng lượng đến Tăng đoàn hay bố thí cho người nghèo, phát lập những đại nguyện. Hơn nữa, chúng ta có thể siêu tích lũy công đức từ những thiện hạnh này dựa trên những kỹ xảo của Kim Cương Thừa như việc tăng trưởng công đức nhờ Chân Ngôn. [Picture text] Hình chạm khắc mô tả cuộc thi triển thần thông trong những hang động Phật Giáo tại Ajanta, Ấn Độ. Ngày đầu tiên, Đức Phật ấn cây tăm của mình xuống mặt đất, ngay lập tức cây tăm mọc thành một cây lớn với đầy hoa đẹp và quả chín. Ngày thứ hai, Ngài biến hiện ra hai ngọn núi châu báu. Ngày thứ ba, Ngài tạo ra một hồ nước bằng đá quý. Ngày thứ tư, tiếng nước chảy từ dưới hồ vọng lên âm thanh tuyên thuyết tất cả phương diện chính yếu của Giáo Pháp. Ngày thứ năm, ánh sáng vàng phóng tỏa từ khuôn mặt Đức Phật. Ánh sáng này phủ khắp toàn bộ thế giới, tịnh hóa tất cả nghiệp chướng, khổ đau của chúng hữu tình. Ngày thứ sáu, Ngài cho mọi người khả năng đọc được suy nghĩ của nhau. Ngày thứ bảy, Ngài chuyển tâm lành cho người thuộc dòng dõi Thích Ca và biến họ thành người trị vì các tiểu vương quốc. Ngày thứ tám, Đức Phật đặt ngón tay phải chạm Ngai sư tử và hướng xuống đất [tư thế bắt Ấn Xúc Địa]. Vào lúc này, Đức Kim Cương Thủ xuất hiện, vụt tỏa ra ngọn lửa kim cương hướng về sáu vị Trưởng lão ngoại đạo. Các vị thuộc Tập Hội của Ngài Kim Cương Thủ đập tan ngôi vị của sáu Trưởng lão khiến những môn đồ ngoại đạo vô cùng hoảng lạn. Những kẻ dị giáo chạy trốn trong sợ hãi. Bấy giờ, Đức Phật mới phóng hào quang với tám mươi bốn ngàn tia sáng sắc cầu vồng tỏa khắp. Phần đầu mỗi tia sáng là một vị Phật ngự trên đài sen. Xung quanh mỗi vị Phật đều đoanh quây bởi đông đủ Tập Hội và tùy tùng. Những người tham dự được diện kiến những vị Phật này và được nghe thuyết Pháp, rất nhiều người đã được giải thoát qua việc chứng kiến cảnh tượng này. Sau những ngày phô diễn phép thuật, 90 ngàn tín đồ ngoại đạo đã từ bỏ các vị thầy của họ, Quy y Phật Pháp, trở thành Tăng sĩ, và không lâu sau chứng đắc quả vị A La Hán. Kế đến, trong bảy ngày tiếp theo, Đức Phật Thích Ca Mâu Ni đã thi triển thêm nhiều thần thông nhân dịp quy tụ đông đảo Tăng chúng và ban cho họ những lời thuyết Giáo. Ngày thứ chín, Vua của các Tầng trời, Phạm Thiên (Brahma), cúng dường lên Đức Phật. Như Lai kéo dài thân Ngài cho đến tầng trời cao nhất của cõi trời Phạm Thiên. Từ thân Ngài, hào quang phóng ra chiếu sáng khắp tất cả mọi phương, và Ngài thuyết Pháp từ tầng trời cao nhất này. Ngày thứ mười, Tứ Đại Thiên Vương là những vị Đại Hộ Pháp đã thỉnh mời Đức Phật giảng nói. Lần này, Đức Phật kéo dài thân mình cho đến khi chiều cao ngang bằng với Tam Giới luân hồi. Một lần nữa. Như Lai phóng tỏa hào quang, chính ánh hào quang trần thuyết Giáo Pháp. Ngày thứ mười một, một vị bảo hộ lớn của Đức Phật, Ông Cấp Cô Độc (Anathapindika), đến cùng dường khi Như Lai đang tọa thiền. Đức Phật không hiển lộ thân tướng nhưng tại nơi Ngài an trụ phóng tỏa ánh hào quang vàng đồng thời âm thuyết Pháp của Đức Phật vang lên hướng về khắp chúng. Ngày thứ mười hai, Như Lai an trụ trong thiền định hướng về tâm vô lượng Từ, từ thân Đức Phật phóng ra những tia sáng vàng chiếu khắp thế giới. Các tia sáng chiếu đến đâu làm tịnh hóa tam độc và làm tăng trưởng lòng bi mẫn của tất cả chúng. Ngày thứ mười ba, khi Như Lai ngồi trên Ngai sư tử, hai tia sáng phóng ra từ nơi rốn Ngài. Hai tia sáng này phóng lên cao 15 mét, trên đỉnh của mỗi tia sáng là một đóa sen, trên mỗi đóa sen là một vị Phật ngự. Từ rốn của mỗi vị Phật nối tiếp lại có hai tia sáng và trên mỗi tia sáng là một vị Phật ngồi trên ngai sen và thuyết Pháp. Các vị Phật cứ như thế, tiếp tục hóa hiện tràn đầy khắp không gian Pháp Giới. Ngày thứ mười bốn, một vị Vua cúng dường hoa lên đức Phật. Như Lai biến những bông hòa thành các cỗ xe cấu tạo bằng đủ loại châu báu. Sau đó, Đức Phật thuyết Pháp cho chúng sinh tựa như một người Bác Sĩ tận tụy chữa lành tất thảy các căn bệnh. Ngày thứ mười lăm, ngày cuối cùng của lễ hội mùa xuân, Vua Tần Bà Sa La (Bimbisara) mang lễ vật đến cúng dường đức Phật. Đức Phật bảo Vua Tần Bà Sa La mang theo những bình chứa thực phẩm thì tức thời các bình chứa đều đựng đầy thức ăn với hằng trăm món khác nhau. Khi Vua và đoàn tùy tùng thọ dụng thực phẩm, thân và tâm họ đều trở nên hoàn toàn sung mãn. Sau đó, Đức Phật hỏi họ, “Tại sao chúng ta phải trải qua vô lượng khổ đaun như vậy trên thế gian này?” Nhờ lực gia trì của Ngài, tất cả chúng sinh, thậm chí cả những loài ngạ quỉ cũng nhận ra rằng, khổ não của họ đều xuất phát từ những hành động sai trái mà chính bản thân họ đã gây ra. Khi trực nhận được điều này, Vua và tất cả tùy tùng đều tăng trưởng đại tín tâm. Ngày đầu tiên của năm mới theo Tạng Lịch là ngày 16 tháng 2, 2018 và Chötrul Düchen sẽ diễn ra vào ngày Rằm tháng Giêng – ngày 2 tháng 3, 2018. Chúng tôi, những thành viên của Tu Viện Samye chúc các bạn một Năm Mới tràn đầy hạnh phúc và đạt được những thành tựu tuyệt vời trên con đường tu tập vì lợi lạc của tất cả chúng sinh! Chúng tôi đồng hoan hỷ tất thảy công đức! Cuối bài giảng Pháp, bạn hãy nhớ thực hành Hồi Hướng công đức có được từ việc đón nhận Giáo Pháp. Khi chuẩn bị kết thúc một ngày, bạn lại hãy dành ra vài phút để nghĩ tưởng lại những lời hướng dẫn, chỉ dạy, hãy làm như thế hàng ngày. Прежде чем читать данное учение, пожалуйста, уделите немного времени тому, чтобы принять удобную позу сидя с прямой спиной. Воспринимая учения, думайте: «Мне невероятно повезло, поскольку у меня есть возможность получать драгоценную Дхарму. Я делаю это для блага всех чувствующих существ, чтобы они были свободны от страданий и достигли полного пробуждения». Бумгьюр Дава — это тибетское название месяца, когда кармические действия умножаются в 100 000 раз. Первые пятнадцать дней первого месяца Тибетского нового года связаны с празднованием пятнадцати дней, в течение которых Будда Шакьямуни демонстрировал чудеса, чтобы пробудить веру и преданность своих последователей. Тем не менее, мы, практикующие буддисты, не просто отмечаем древний праздник. Конечно же, мы вспоминаем о доброте Будды и его великих последователей. Все великие мастера говорят о том, что нам необходимо накопить как заслугу, так и мудрость, чтобы достичь пробуждения и по-настоящему приносить пользу существам. Таким образом, мы можем сорадоваться такой потрясающей возможности в этот первый месяц нового года, чтобы искусно действовать и практиковать для всех чувствующих существ. Мы можем сорадоваться своему драгоценному человеческому рождению, вдохновлять себя и посвящать своё время активностям, которые ослабляют страдания и приносят истинное счастье. В первый день Будда воткнул в землю зубочистку, и та тотчас же превратилась в прекрасное дерево со множеством цветов и спелых фруктов. Во второй день он явил две горы драгоценных камней. На третий день он создал озеро из драгоценностей. На четвертый день из озера зазвучали голоса, объяснявшие все аспекты Дхармы. На пятый день лицо Будды излучало золотой свет, который заполнил всю вселенную, очищая страдания чувствующих существ. На шестой день он наделил людей способностью читать мысли друг друга. На седьмой день он превратил клан Шакья (благодетелей Будды) в повелителей мира. На восьмой день Будда надавил пальцами правой руки на свой трон. В тот же миг появился Ваджрапани, размахивая пылающим ваджром в направлении шести неверующих учителей. Свита Ваджрапани разогнала еретиков и разгромила троны их учителей. Еретики в страхе бежали. В этот момент Будда испустил восемьдесят четыре тысячи лучей радужного света. На кончике каждого луча света на лотосовом троне восседал будда. И каждый будда был в окружении свиты. Те, кто наблюдал всё это, увидели, как эти будды учили Дхарме, и многие достигли пробуждения от одного только вида происходящего. Увидев эти чудеса, девяносто тысяч последователей отреклись от своих прежних учителей, приняли буддистскую Дхарму и монашество, и позднее стали архатами. Затем, в течение еще семи дней Будда Шакьямуни демонстрировал ещё больше чудес для всего собрания и даровал учения. На девятый день король богов Брахма сделал подношения Будде. Будда увеличил своё тело до таких размеров, когда оно достигло наивысших небес. Затем он засиял лучами света во всех направлениях, и при этом продолжал даровать учения Дхармы. На десятый день четыре великих короля-защитника Дхармы пригласили Будду выступить с речью. Тогда Будда увеличил своё тело до таких размеров, что оно достигло вершин самсары. И вновь он засиял лучами света, распространявшими Дхарму. В одиннадцатый день великий покровитель Анатхапиндада поднёс дары медитировавшему Будде. Будда сокрыл своё физическое тело, а вместо него распространил золотой свет и свой голос так, чтобы все могли слышать. На двенадцатый день Будда вошёл в медитацию великой любви, и золотой свет засиял из его тела, заполняя миры. Эти лучи света очистили от трёх ядов наблюдавших за происходящим, и в них зародилось великое сострадание. На тринадцатый день Будда, сидя на львином троне, испустил два луча света из своего пупка. Эти лучи света достигли пятнадцати метров в высоту, и на конце каждого луча был лотос, а на каждом лотосе — будда. Из пупка каждого будды сияли по два луча света, на концах которых сидели будды, даруя учения Дхармы, сидя на лотосовых тронах. Эти будды заполнили собой все миры. На четырнадцатый день король поднёс Будде цветы. Будда превратил эти цветы в колесницы из драгоценных камней. Затем Будда даровал учения Дхармы всем существам, подобно тому как врач излечивает больных. В пятнадцатый, завершающий день весеннего праздника, король Бимбисара поднёс Будде дары. Будда попросил короля Бимбисару принести ёмкости для еды, и те спонтанно заполнились пищей, обладающей сотней различных вкусов. Эта пища полностью удовлетворила тела и умы присутствовавших. Тогда Будда спросил: «Почему мы испытываем такие неизмеримые страдания в миру?» В силу благословения Будды, все существа, даже демоны, осознали, что они сами являлись причиной своих страданий из-за ошибочных действий. Когда собравшиеся осознали это, в них зародилась великая вера. Тибетский новый год начался 16 февраля 2018, а Чотрул Дючен выпадает на полнолуние, 2 марта 2018. Мы, команда Института Самье, желаем вам счастливого Нового Года и великих свершений в вашей практике для пользы всех существ! Мы сорадуемся всей заслуге и добродетели! По завершению учения, пожалуйста, не забудьте посвятить заслугу от получения учений Дхармы. В течение дня время от времени вспоминайте об этих наставлениях. Перш ніж читати це вчення, будь ласка, приділіть трохи часу тому, щоб зайняти зручну позу сидячи з випрямленою спиною. Сприймаючи вчення, думайте так: “Мені надзвичайно пощастило, адже маю можливість отримувати дорогоцінну Дгарму. Роблю це заради блага усіх живих істот, щоб вони були вільні від страждань та досягли повного пробудження”. Бумґ’юр Дава — це тибетська назва місяця, коли кармічні дії збільшуються у 100 000 разів. Перші п’ятнадцять днів першого місяця тибетського нового року відзначають п’ятнадцять днів, впродовж яких Будда Шак’ямуні демонстрував дива, аби пробудити віру та відданість своїх послідовників. Проте ми, практикуючі буддизму, не лише відзначаємо стародавнє свято. Звичайно ж, ми згадуємо про доброту Будди та його видатних послідовників. Однак ще важливішим є те, що у цей період часу віддані практикуючі приділяють особливу увагу своїй поведінці та медитації. Цей місяць дарує нам виняткову можливість накопичити величезну кількість заслуги. Це можливо тому, що в цей період часу усі активності породжують карму, що є сильнішою у сто тисяч разів, ніж зазвичай. Тибетська назва містить слово “бум”, яке означає примноження наших дій у 100 000 разів. І це примноження стосується і сприятливих днів також! Таким чином, виконуючи практику, ми дійсно можемо накопичити численні чесноти заради блага усіх істот. Усі великі майстри говорять про те, що маємо накопичувати як чесноти, так і мудрість задля досягнення пробудження та справжньої допомоги істотам. Тож можемо співрадіти цій надзвичайній можливості у цей перший місяць нового року, задля майстерних вчинків та практики заради усіх живих істот. Ми можемо співрадіти своєму дорогоцінному людському народженню, надихати себе та присвячувати час активностям, які послаблюють страждання та приносять справжнє щастя. У перший день Будда встромив у землю зубочистку, яка тієї ж миті перетворилася на чудове дерево з незліченними квітами та дозрілими фруктами. На другий день він створив дві гори із коштовного каміння. На третій день він створив озеро з коштовностей. На четвертий день з того озера лунали голоси, що тлумачили усі аспекти Дгарми. На п’ятий день обличчя Будди променилося золотим світлом, яке заповнило всесвіт та очистило страждання живих істот. На шостий день він дарував людям здібність читати думки одне одного. На сьомий день він перетворив клан Шак’їв (благодійників Будди) у правителів світу. На восьмий день Будда натиснув на свій трон пальцями правої руки. Тієї ж миті з’явився Ваджрапані, він розмахував палаючим ваджром в напрямку шести невіруючих учителів. Почет Ваджрапані розігнав єретиків та розгромив трони їх учителів. Єретики втекли зі страху. Тоді Будда випустив вісімдесят чотири тисячі променів райдужного світла. На кінчику кожного променя на лотосовому троні сидів будда. І кожен будда був із почетом. Свідки побачили цих будд, які навчали Дгармі, та багато істот досягли пробудження лише через саме видовище. Внаслідок цієї демонстрації чудес дев’яносто тисяч послідовників зреклися своїх попередніх вчителів, прийняли буддове вчення, взяли обітниці ченців та пізніше стали архатами. Потім, впродовж іще семи днів Будда Шак’ямуні продемонстрував ще більше чудес для усього зібрання та дарував учення. На дев’ятий день король богів Брахма зробив офіри Будді. Будда збільшив власне тіло до таких розмірів, що воно досягло найвищих небес. Потім він засяяв променями світла в усіх напрямках та при цьому продовжував дарувати вчення Дгарми. На десятий день чотири великі королі-захисники Дгарми запросили Будду виступити з промовою. Тоді Будда збільшив власне тіло до таких розмірів, що воно досягло вершин самсари. У одинадцятий день великий покровитель Анатхапіндада зробив офіри Будді, який перебував у медитації. Будда приховав своє фізичне тіло, а замість нього розповсюдив золоте світло та власний голос так, щоб усі чули. На дванадцятий день Будда увійшов у медитацію великого кохання, і золоте світло засяяло з його тіла, заповнюючи світи. Ці промені світла очистили від трьох отрут тих, хто спостерігав за цим, і у них зародилося велике співчуття. На тринадцятий день Будда, сидячи на левовому троні, випустив два промені світла зі свого пупка. Ці промені світла досягли п’ятнадцяти метрів у вишину, а на кінчику кожного променя був лотос, а на кожному лотосі — будда. З пупка кожного будди сяяло по два промені, на кінчиках яких на лотосових тронах сиділи будди та дарували вчення Дгарми. На чотирнадцятий день король офірував квіти Будді. Будда перетворив ці квіти на колісниці з коштовного каміння. Після цього Будда навчав Дгармі усіх істот, подібно тому, як лікар зцілює хворих. На п’ятнадцятий, завершуючий день весняного святкування, король Бімбісара зробив офіри Будді. Будда попросив короля Бімбісару принести посуд для їжі, і той посуд спонтанно заповнився стравами із сотнею різноманітних смаків. Ця їжа повністю втамувала тіла та уми присутніх. Тоді Будда запитав: “Чому ми переживаємо такі безмірні страждання у світі?” Силою його благословіння усі істоти, включно із демонами, усвідомили, що вони самі спричиняли власні страждання через хибні дії. Як вони це зрозуміли, то в них зросла велика віра. Тибетський новий рік почався 16 лютого 2018, а Чотрул Дючен припадає на повний місяць, 2 березня 2018. Ми, команда Інституту Сам’є, бажаємо вам дуже щасливого Нового Року та великих звершень у вашій практиці заради блага усіх істот! Ми співрадіємо усім заслугам та чеснотам! По завершенню учення, будь ласка, згадайте про те, щоб присвятити заслугу від отримання вчень Дгарми. Впродовж дня час від часу пригадуйте ці настанови. ที่สำคัญยิ่งกว่านั้น ในช่วงเวลาเหล่านี้ ผู้ปฏิบัติที่อุทิศตนจะใส่ใจเป็นพิเศษกับการบำเพ็ญตนและปฏิบัติสมาธิภาวนา เดือนนี้เป็นเดือนที่เราจะมีโอกาสพิเศษในการสั่งสมบุญกุศลมากมายไร้ประมาณ นั่นเป็นเพราะระหว่างช่วงเวลาเหล่านี้ กิจกรรมทั้งหลายจะส่งผลกรรมมากขึ้นเป็น 100,000 เท่า ในภาษาทิเบต คำว่า “บุม” เป็นตัวเลข หมายถึง การกระทำทั้งหมดของเราส่งผลเพิ่มพูนขึ้น 100,000 เท่า และการเพิ่มพูนนี้เกิดขึ้นในวันอันเป็นมงคล เมื่อเราปฏิบัติธรรม เราสามารถสั่งสมบุญกุศลมากมายเพื่อประโยชน์ของสรรพสัตว์ทั้งปวง! 0 responses on "Bumgyur Dawa: Month of Miracles and Merit"